Eleven members of the Belgian branch of the Church of Scientology have gone on trial accused of fraud, extortion and running a criminal organisation. An investigation was launched after an employment agency complained that the church had made fake job offers to recruit new members. 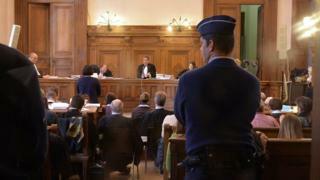 A conviction could see the Church banned in Belgium. Two organisations affiliated with the group are facing similar charges. All parties deny the allegations. Belgian investigators first began investigating the Church in 1997, the AFP news agency reported. A second investigation was launched in 2008 when an employment agency in Brussels alleged that the Church was recruiting new members by offering fake jobs. The Church said last week that it "goes to court with the firm intention of seeing the fundamental rights of its Belgian members finally recognised", AFP reported. Created by science fiction writer L Ron Hubbard in 1954 and based in Los Angeles, California, the Church has generated controversy around the world. Critics say that it is a cult and that it scams its members, while supporters maintain that it provides spiritual support to its followers.